It has been difficult in the past to puzzle out the earliest history of this house as it is obviously Georgian and had been refronted with two bow windows judging from early photographs that show it with 3 upper floor windows instead of the present two. The Census and Tithe Map reveal that Ann Liddon, daughter of James Warden owned it and lived there with her two unmarried daughters. I always assumed that as she owned most of the village as Lady of the Manor it had been originally owned by her father and that was as far as I could go back. 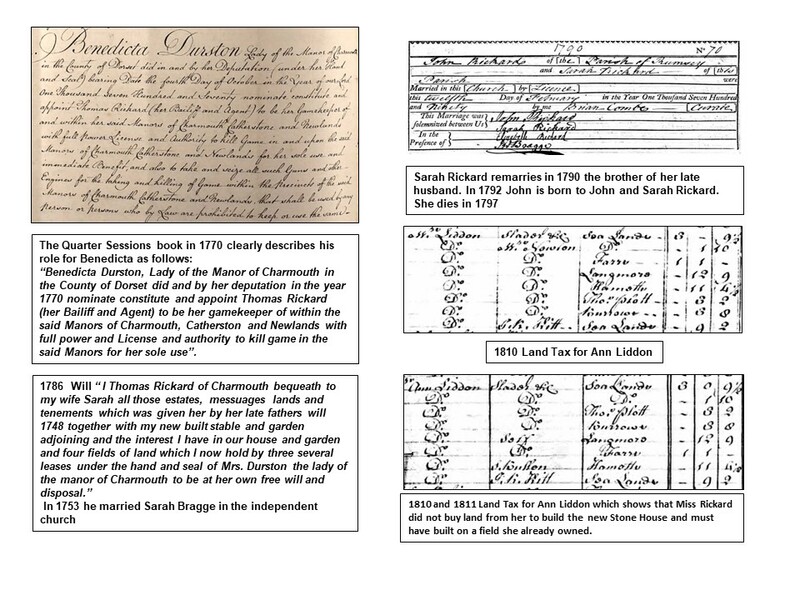 Since studying the Land Tax and Poor Rate records I have at last been able to take it back to when it was built in 1811 on land given by Benedicta Durston to her Steward - Thomas Rickard, by his daughter, Mary. The missing link was a crossed out entry in the Land Tax List for 1831 which details Mrs Liddon as the new owner of the “Stone House” in that year. In the past I had assumed that this referred to the present Stone House on the Street, but checking the records for that year it seems to have been occupied by Dr. Sweeting. Fortunately the name of the house appears in the tax records back as far as 1811, which must have been the year it was built as there is no details before then. Mary Rickard is the owner in that year and seems to have built it in a field that she already had inherited from her father. It is described as The Stone House and she rents it out to a Mrs. Ridout, who is paying 5/- Land Tax on it, whilst she continues to live in a smaller property paying 1/9d. 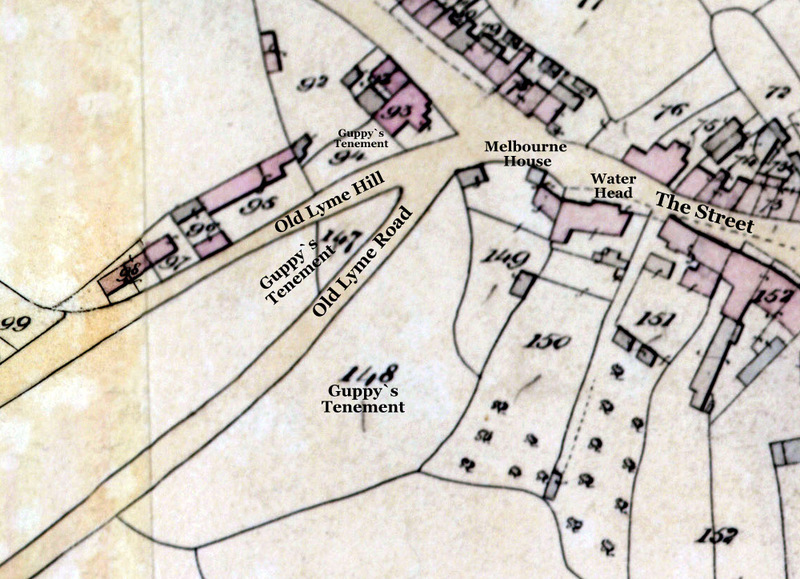 The 1841 Tithe Map shows it must have had a larger plot of land called Guppy’s behind it as it was later bisected by the Old Lyme Road. 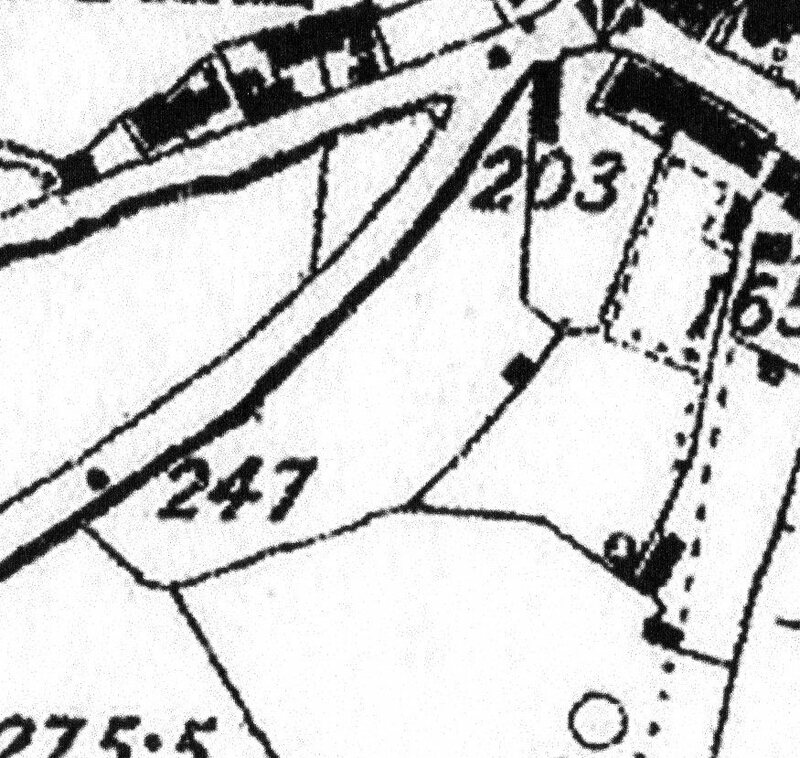 The 1825 Poor Rates detail that Benjamin Love was renting the adjacent field from Misses Rickards which is described as New Road Close. 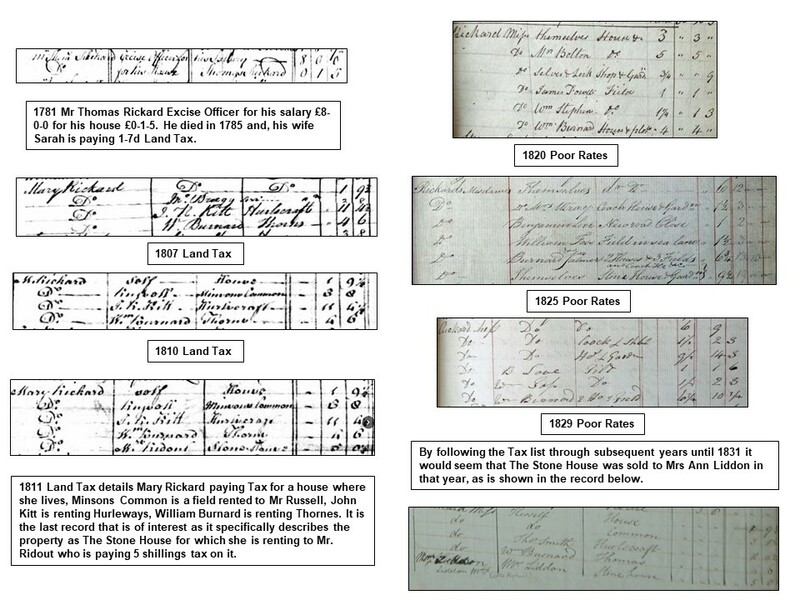 The records shown here will help to substantiate that the house was built in 1811 on a field once owned by the Lord of the Manor by Mary Rickard and was later bought in 1832 by Ann Liddon, whose family continued to own it until 1886. Melbourne House stands on part of a field which had in previous centuries been known as Guppy`s tenement. there was no doubt an earlier building which had belonged to members of the Guppy family who regularly appeared in the Parish records. There are a number of references to Guppy's Tenement in old documents. 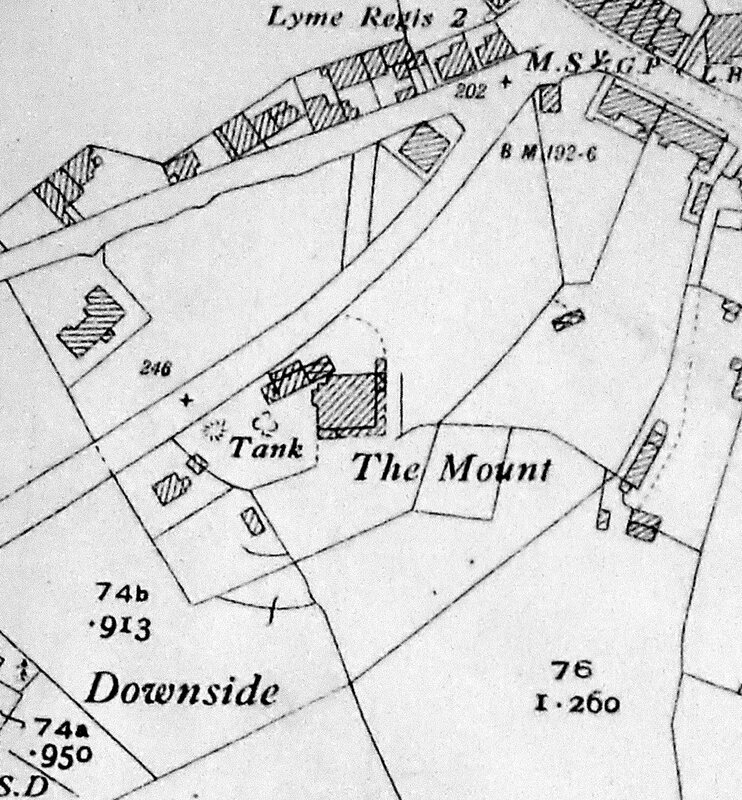 The adjoining property now known as "The Well Head", used to be the Farm House for Foxley Farm and was bought by John Minson of Eype in 1711 has deeds that are relevant. For in 1735 Anthony Ellesden, the Lord of the Manor, granted to John Minson...all that cottage in Charmouth called Guppy`s tenement, consisting of a Messuage , garden and meadow called Common Close containing 1 acre and common Pasture in a Common called Langmore with the appurtenances were formerly in the possession of George Mantle. It would seem from this that the property was owned by the Lords of the Manor, which could be traced back to the Abbots of Forde, who were owners of the village from 1139 until 1539. The Cartulary which still exists details what is probably a refrence to the land when it describes the boundaries of the new Borough of Charmouth in 1320 as follows: “ every burgess residing in the borough might with his horse or bullocks into Common Land vis. From the road where Geoffrety Heyrun lives westward. So to Stephen Payn`s and to the ditch which was Robert Rossi`s to the Langoresgeth ( langmore Gate ) and then to the Steps”. No. 10 That as under a will, proved in 1792 (James Warden), this property is charged with an annuity of £20 payable to a gentleman (James Wardens son) now aged 86 years, the vendors shall not be required to procure a release or a discharge of the premises from the annuity, but the same shall bereturn3ed on a House, Garden and Field, called Guppy`s Tenement, containing 1 acre 17 perches, in the occupation of Matthew John Liddon Esq & Joseph Hodges, situate in Charmouth of the annual value of £30 or otherwise, for the purchaser shall accept the joint and several covenants of the Vendors for his indemnity against the said annuity, at the option of the vendors, and it shall not be required of the vendors to obtain any conveyance or reconveyance of any legal estate in reference to such annuity or the concurrence of any trustees or trustee in respect of any trust created more than 40 years before the date therof. 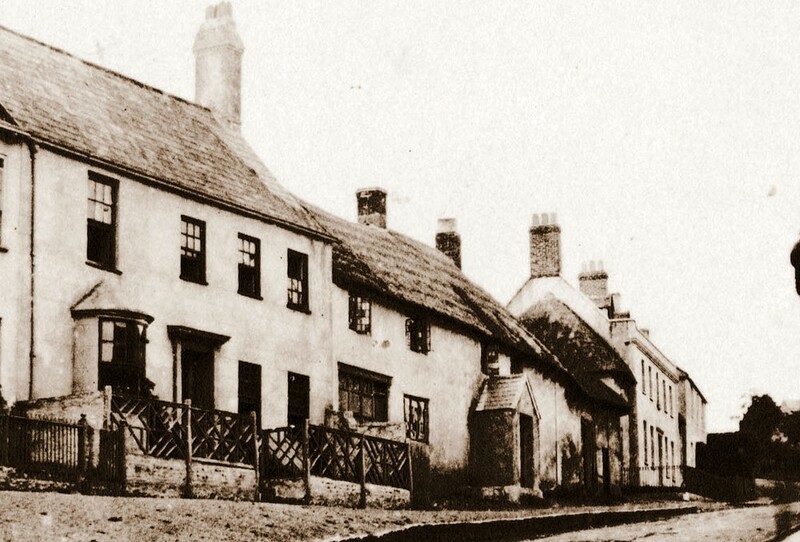 On January 24th 1854 Matthew and Lucy Liddon sell Estate to George Frean of Plymouth for a total of £9100, but after paying off the mortages they receive £5061. James Warden`s son William is still shown as receiving £20 a year from the Estate. James Wardens Will for 1792 mentions that "I bequeath unto my dear wife my house on the north side of Charmouth Street in part of which farmer Bowditch now resides with the outhouses thereto belonging and one common of pasture called Thomas’s plot adjoining the Fountain Meadow and one other plot called Little Grange on the north side of Charmouth Street opposite Roadhorn Hill".It would appear from this abstract that James and his wife were living oin the Old Manor House opposite the Church. He had only bought the Manor of Charmouth 4 years before his untimely death in a duel and it would seem that "Langmoor Manor was not finsihed.Little Grange would be wehdere Askew House would later be built and Thomass`s plot is no doubt. The 1783 Esate boom for the village has Little Grange as occupying 3roods 1 perch and TThomas Orchard 1 rood 29perches and Thomas`s plot as 1 acre 8 perches. 1841 Census showing Ann Liddon, aged 70, Daughter of James Warden living with her daughters Sophia,aged 35,and Lucy, aged 30 at Melbourne House. On the death of her Mother, the property passed to Ann, who had married captain Matthew Liddon, R.N. They appear to have been badly off, as the Estate was mortgaged to raise money for the education of her children, and Langmore Manor was occupied by Mrs. Austin. Prior to this year Ann rented Melbourne House and from 1821 to 1832, the Poor Rates show Mrs Palmer living at Melbourne House. 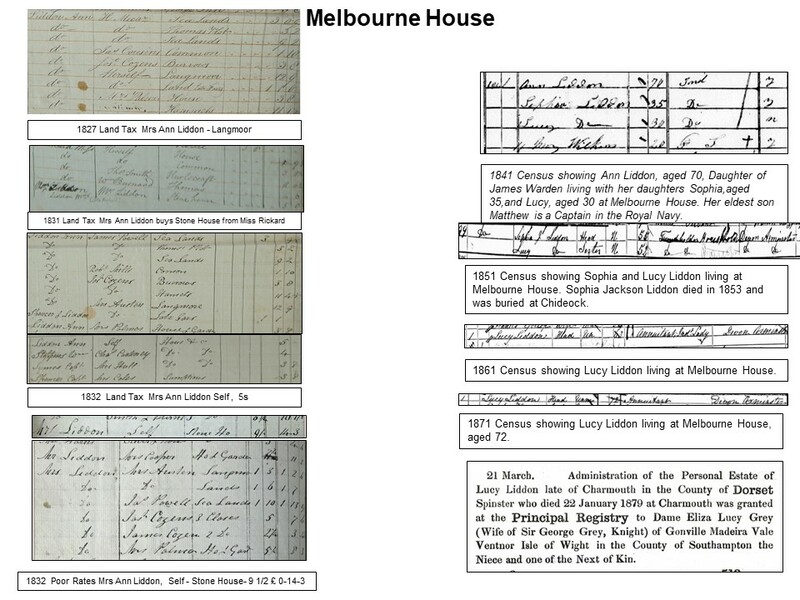 1851 Census showing Sophia and Lucy Liddon living at Melbourne House. 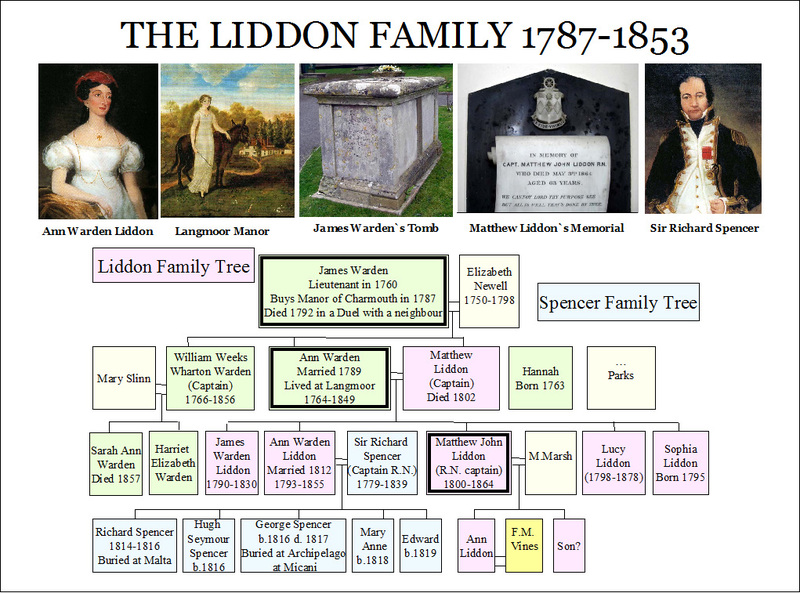 Sophia Jackson Liddon died in 1853 and was buried at Chideock. The present owners of Melbourne House have kindly allowed me to study their deeds, which I have abbreviated, as many are long winded and repetitive. They supply useful infoarmtion and dates regarding the house. The earliest is dated October 1st 1867 and refers to Lucy Liddon of Charmouth, Dorset, Spinster of the 1st part, Honor Maria Liddon, Widow and Matthew Liddon, her son, (a minor of about the age 6 years) both of Chideock in the said County of the 2nd part and Andrew Tucker of Charmouth, Gentleman and William James Atkins of Lyme Regis , Bank Manager, who were the trustees of the 3rd part. It shows that the said Lucy Liddon and her brother Mathew John Liddon, a Captain in the Royal Navy, deceased, were at the time of his decease jointly entitled to the dwelling house, garden and close of land. He died on the 3rd May 1864, intestate, leaving the said H.M. Liddon, his widow and the said M. Liddon, his only son and heir at law. It was agreed that the said Lucy Liddon should retain life interest in the house, and released from payment of rents. 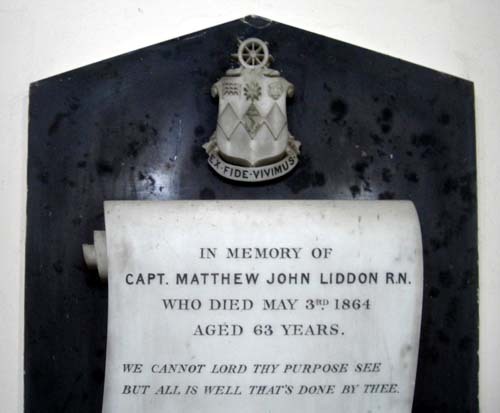 It would then pass to her nephew, Matthew Liddon. All that property on the south west side of the Main Street in occupancy of L. Liddon and Mr. Bazley Dean, her tenant. But events take over and Honor Maria, wife of the late Matthew Lidddon remaries William Harris of Penderfielkd Road, Wakefield in 1867. Her son Matthew died young in 1879, leaving his estate to his sister Anne. When Lucy Liddon, the occupier of Melbourne House died in 1879, it was left empty until 1884, when her niece inherited the house on her attaining the age of 21. Anne Liddon married Frank Martin Vines, a Farmer from Gloucester in 1886 and soon after sold Melbourne House to Richard Oliver, who owned a number of properties in Charmouth, for £425. 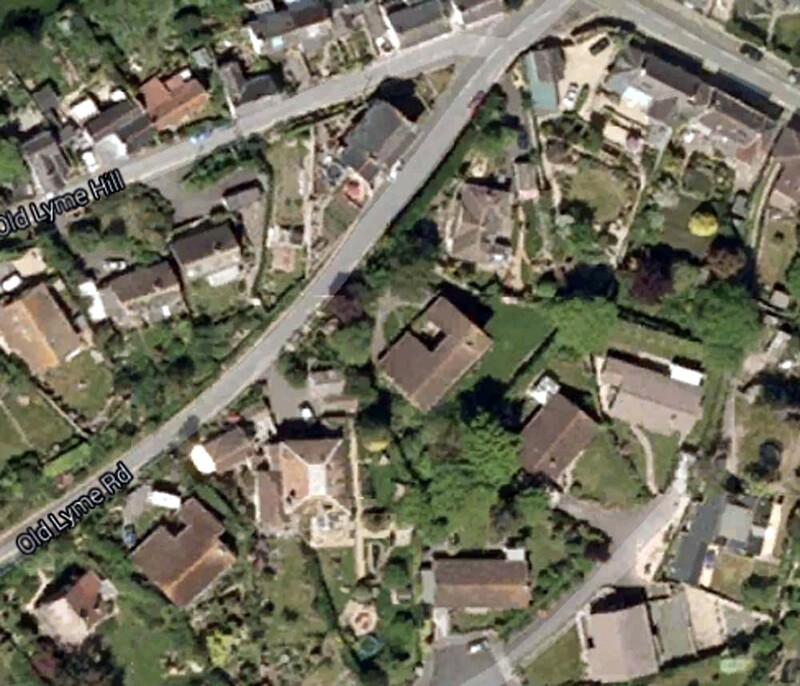 One undivided moiety of all that de wheeling house,garden and close of land situated at the upper part of Charmouth in the County of Dorset in the South west side of the Main Street or road there containing by measurement 1 acre 17 perches or thereabouts. It would seem that the house still occupied a large plot. 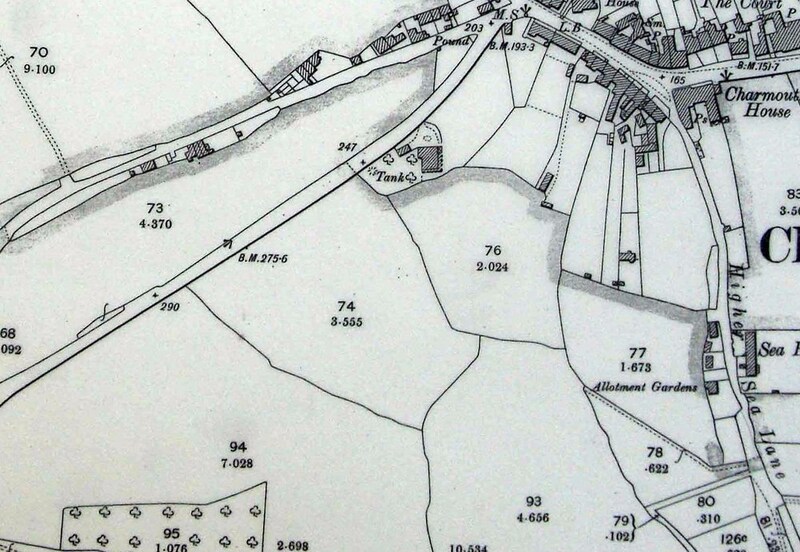 But a portion of the property,being the field fronting the road to Lyme Regis was sold to Frederick Niblett of Longthorpe, Brondesbury, London on the 19th March 1897. "When Oliver, a former owner, employed Ernest Gollop in the 1880s to put in bay windows, the whole front collapsed and had to be shored up with timber. The workshop over-looking the Lyme Road had been owned by Douglas Board, a carpenter. Board was born in 1850 and at the age of 83 he said that he remembered, as a boy, peeling potatoes at the Rectory for the at the celebration of the Prince of Wales`s Wedding. The House was later sold to Thomas Tarr, who sold it back again to Oliver when he bought Portland House for £250. Mary Alice and Fanny who were twins born to John and Elizabeth Coles in 1847,lived there in 1898". On his death in 1901, Richard Oliver bequeathed all his properties to his wife Emily. She was to live on for a further five years and her Will revealed that she wished her Trustees to pay the rents to her brother John Lane as long as he lived and then to her sisters Mary Jane Lane and Mary Lane. 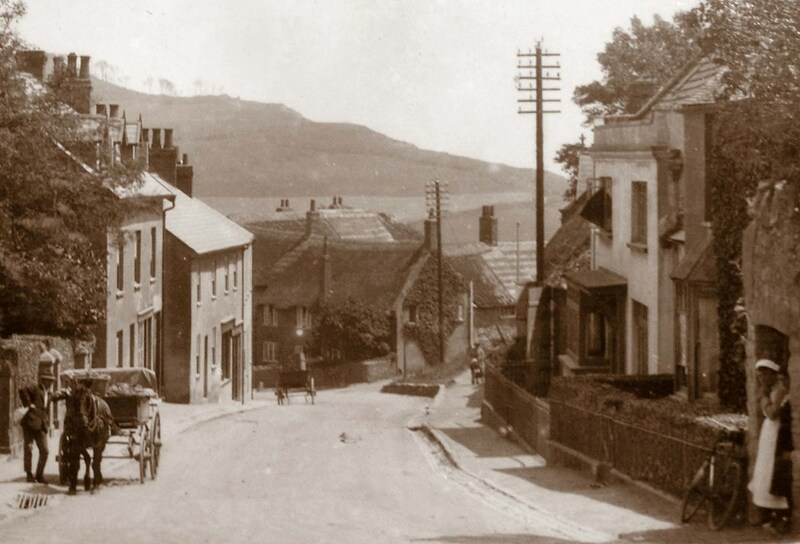 Mary Lane was to die in 1908, her brother the following year and her sister, who was living in Charmouth in 1914. A Deed for 1st November, 1910 between Thomas Greenslade Luxton of Cheriton Fitzapaine, Devon Gentleman and George Owen Heath,Exeter, Surveyor of the one part, who acted for the Landlords and Mary Knott of Charmouth, Widow as Tenant. She was paying £27 yearly for a dwelling house known by the name of Melbourne House. Mary in the 1901 Census was shown as a Lady of Independent means, aged 40 living with her sisters, Anne and Agnes Willis.They lived next to Elizabeth Tarrs stationery shop on the Street facing on to Higher Sea lane. On the death of John Lane, the last of the heirs to Richard Olivers Estate, Melboune House as well as Grasmere, Omega and The Retreat were placed in an Auction held at The Coach and Horses on the 18th March, 1914. She takes out a mortgage for £400 and pays just over this ammount to secure the house. The deed shows that it was" bounded by property of F. Niblett and on the east by the House and Land belonging to A.D. Pass. All said premises were formerly in the occupation of Thomas Tarr, afterwards of Coles and are now in the occupancy of the Purchasee". She was to live there until 1936 when it was purchased by Henry and Elizabeth Stamp for £500. The plan and description show it "with the strip of Garden in front and the yard and ash house in rear and passage at the side thereof and the boundary walls surrounding the same". But the following year they paid a further £100 for the rear garden from Mary Knott, who had moved to Budleigh Salterton. When Henry Stamp finally died in 1962 he left it to his son, Gilbert Henry Stamp, who is described as a Gardener living at Melbourne House and daughter Amelia. She had been married to Frederick Mclachlan and die in 1990, aged 79. When Gilbert died two years alter it was Peter, son of Amelau Mclachlan who was to inherit the house. The Deeds show that Peter and Gillian Butcher were to purchase Melbourne House in 2000. 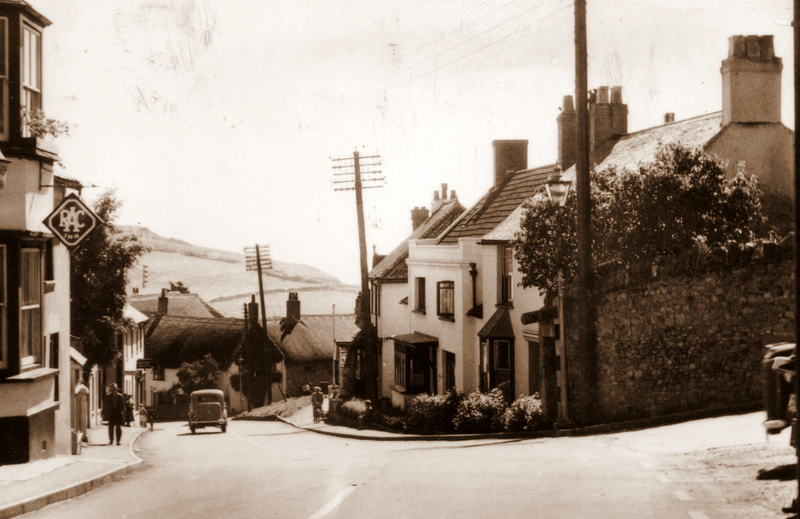 As a footnote to the connection with Charmouth and the Liddons, The Book of Remambrance in the Church records Harry Liddon Vines, missing April 1943 and Prudence F. Liddon Tosetti was baptied in Charmouth in 1944. This photograph dating back to 1870 shows Melbourne House in the distance with three windows on the upper floor. It was altered in the 1880s by the owner Oliver according to the historian, Reginald Pavey, who lived next door at The Well Head. The same view today, remarkeably similar after 100 years. 1841 Tithe Map showing Plot 94 Guppy's Tenement - 16 perches,Plot 147 Guppy's Tenement - 8 perches.Plot 148 Guppy's Tenement a Meadow - 3r. 16p,Plot 149 House and Garden (Melbourne House) - 1r 1p. 1888 Map showing the property enlarged. 1926 Map shwoing the house virtually as we see it today. An aerial view today, showing the additional houses and buildings now occupying what was originally Guppy`s Tenement and field. The report on the fire at Melbourne House in 1876, then owned by Miss Lucy Liddon. To close a trust estate, Mesrs. 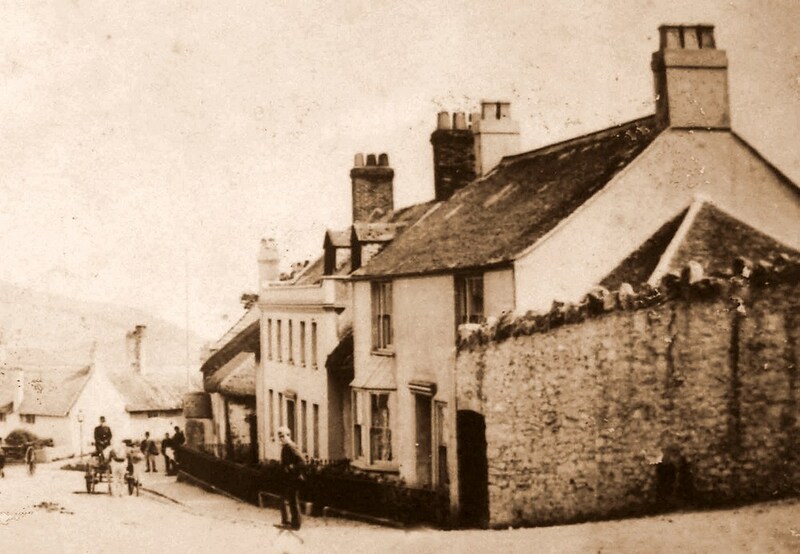 Heath Bros., of Bedford Circus, Exeter, conducted a successful sale of freehold residences at the "Coach and Horses" Hotel, Charmouth,, yesterday, “Melbourne House” , with a large gardens, let at £27 per annum, was sold to Mr. Linsoll for £402, and “Grasmere” with garden back and front, let at £30 per annum, was secured by Mr. Jackson, solicitor, of Exeter, on behalf of a client for £425. Mr. Jackson also gave £225 for “Omega House” , let at £18 per annum; and “The Retreat” , with large garden back and front, let at £16 per annum went to Mr. Clarke for £300. Western Times, 20th March 1914. Mr Linsoll, must have been acting as an Agent for Mrs Knott. The earliest Deed dated 1867, when on the death of her brother, Matthew, Lucy agrres to live rent free in Melbourne House during her life time and leave it to her Nephew on her death. The birth certificate for Ann, daughter of Matthew and Honor Liddon, 4th June, 1863. The sale of part of the former Guppys lands to Fredderick Nesbitt in 1897 by Richard Oliver. A plan of the property bought by Marsh in 1936. The Land Registry Title today. Letter relating to Mrs Knott`s ownership to Melbourne House, by a descendant. 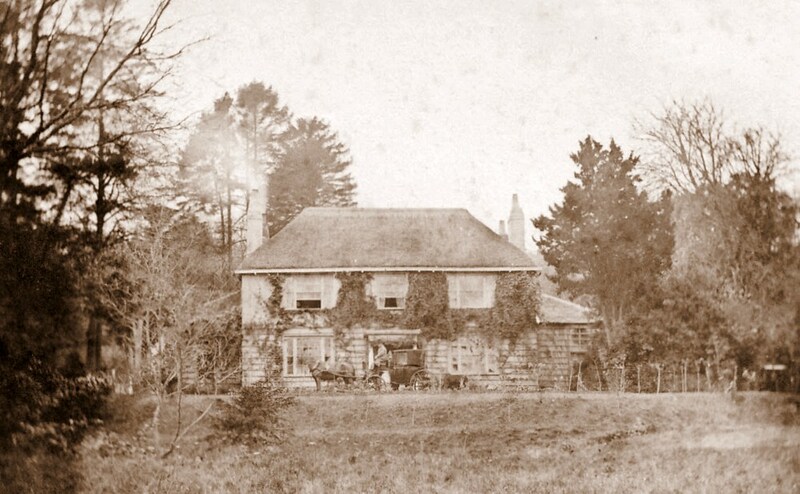 Langmore House, the former house, where Anne Liddon lived, before moving to Melbourne House. 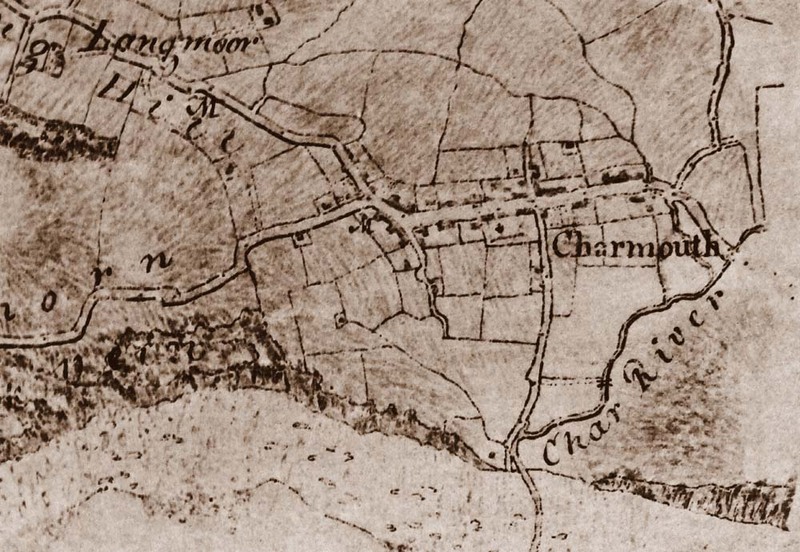 1810 Map of Charmouth by Colonle Mudge, showing the village before Old Lyme Street cut through to Lyme Regis and bisecting the Field, nown as Guppy`s Tenement. Trewman`s Exeter Flying Post Thursday, October 6, 1803; Issue 2085. 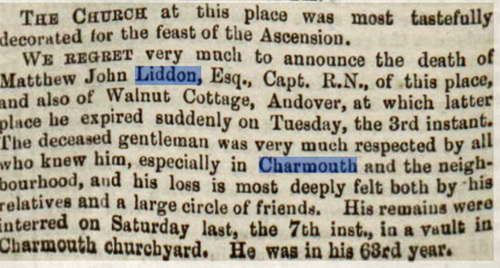 Advert for Ann Liddon (nee` Warden) to borrow £600 against the Manor of Charmouth in Trewmans Exeter Flying Post . She had lost her husband the year before and had 5 children to bring up and educate. 1818 Ann borrows a further £555 to better educate her children. 1854 On January 24th Matthew and Lucy Liddon sell Estate to George Frean of Plymouth for a total of £9100, but after paying off the mortages they receive £5061 which is split between them. James Warden`s son William is still shown as receiving £20 a year from the Estate. 1855 Matthew Liddon sells some property to John Hawkshaw which did not constitute that sold to Frean. Particulars of a truly Valuable & singularly Compact Freehold Estate comprising the Manor of Charmouth, with the rights, Royalties, Fines Etc, Also a Comfortable Residence distinguished as Langmoor House, containing accomadation for a respectable family, productive garden, Coach House, stabling approached by a carriage drive through Park like land beautifully timbered, on the high road leading from Bridport to Axminster, together with several enclosures of Meadows, Arable & wood land approaching 100 acres a portion of which is bounded by the Sea Shore, on which, and in the cliffs, are found an abundance of Cement & Blue Lias Stone, Pyrite and other minerals. The right of collecting the same appertains to this manor from which a rental may be obtained, also the right of fishing in the River Char. Which will be sold by Auction, by Messrs H. Brown & T.A. Roberts at the Auction Mart,opposite the Bank of England on Thursday 18 th August 1853 at 12 o clock in one lot. The Premises may be viewed on Application to Matthew John Liddon Esq. RN Charmouth of whom particulars with a plan may be had. This compact & truly Valuable Estate offers the most Important & substantial recommendation to the Capatialist as it embraces some of the most Valuable and Fertile land in the County of Dorset, of which possession may be a considerable portion, together with the residence at Michaelmas next. The Timber also for the Eastern part, eshews an ornamental portion round the House,young and thriving, among other advantages it offers are an important oppurtunity to any Gentleman desirious of possession in political influence, being attached to the Borough of Lyme Regis, of which it forms a considerable portion, but in a commercial point of view the advantages desirable from the Mineral Production in the manufacture of Roman Cement and Blue Lias Lime, are not to be excelled. The Estate is all Freehold and the poor and other rates very low, is situate in that truly Picturesque valley of Charmouth, about 2 miles from Lymed Regis and 5 from Axminster. Comprises a Comfortable Family residence, approached by a carriage Drive through park with Lane adjoining High Road leading from Bridport to Exeter, supplied with excellent Springs of water and contains 4 principle bed chambers, a dressing Room, 2 Seravants Sleeping Rooms, Drawing, Dining & Breakfast Room, Entrance Hall, Kitchen, Skullery, Dairy and other Domestic offices, Coach House & Stabling. Productive Garden and Orchards together with various pieces of Arable, Pasture and Woodlands comprising in the whole 97 acres, 2 roods ( be this the same a little more or less) Many portions of which present desirable sites for building, commanding the most picturesque views over a vast extent of country and the English Channel, within easy approach to the South W and G.W railways by coaches passing and repassing daily.The manor of Charmouth extends over 500 acres, including the whole of the village. Among the many other advantages is an ancient grant from the Crown to take toll on all stone, sand, seaweed and other productions removed from an extensive range of the Seashore between High and Low Water mark, which with the abundantly supply of Blue Lias and Cement Stones, Pyrites and other Mineral and Fossil Productions in the Cliffs and on the Beach, from which Charmouth is so justly celebrated, with the great facilities of water carriage. A large annual income may be realised, and also fines, fees, Quit Rents, and other advantages attached to the Manor. £50 per annum has been offered for the privilege of collecting the Blue Lias & Cement Stone on the Beach only, a very much larger Rental may be had if permissions be extended to dig into the Cliffs, also for collecting the Pyrites, Minerals and Fossils. No.11 That no other Evidence of the Execution of a certain conveyance upon trust for sale and power of attourney dated 2 nd May 1851, by Lady Spencer shall be .. the vendors than that which appears in the deed, being the covenant residing at Albany, King George`s Sound, Western Australia, and another witness. 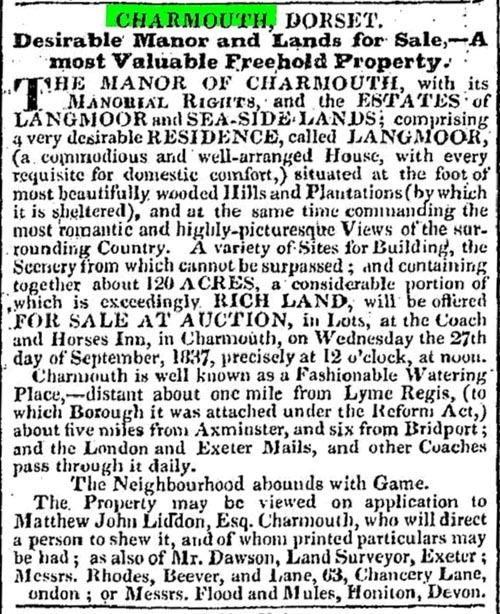 The Manor of Charmouth with it's Manorial Rights , and the Estates of Langmoor and Seaside Lands with 120 acres was auctioned on 27th of September, 1837 at the Coach and Horses in Charmouth. But it could not have met its reserve as the sale did not go through until 1854.